Laurie Betts Hughes: Bio & Choral Music | Santa Barbara Music Publishing, Inc.
Laurie Betts Hughes (b. 1977) has taught all levels of vocal and instrumental music in both public and private schools. 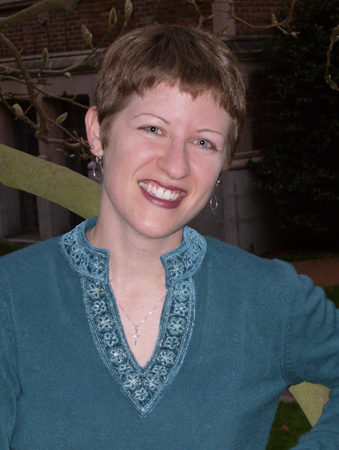 She taught piano at Oregon State University and is an active church musician, choral adjudicator, and clinician. Currently, Laurie is a DMA candidate in Choral Conducting at the University of Washington where she studies with Geoffrey Boers and Giselle Wyers. Laurie earned her MM in Choral Conducting from Colorado State University and her BM in Piano and Musicology from Oberlin Conservatory. She was featured on the “Women Choral Composers Concert” in Corvallis, OR in March of 2006, is the first recipient of the Robert Fountain Memorial Scholarship in Choral Conducting from Oberlin Conservatory, and was a national finalist in the BMI John Lennon Songwriting Competition in 2002. Laurie has a special interest in American folk music and enjoys her guest appearances directing the Seattle SeaChordsmen Barbershop Chorus. Laurie Betts Hughes has 3 titles published with Santa Barbara.